It seems that almost everything in the travel industry is on sale these daysfrom cheap air tickets to cut-rate hotel rooms. With the economy keeping some travelers at home, airlines and hotels have been lowering their prices in an effort to lure more people to travel. This accounts for some of the absolutely amazing deals popping upincluding beach vacation packages for travel between now and December 20 for as little as $499 including air like I saw on Cheap Caribbean. Most of the great beach deals on Cheap Caribbean for all-inclusive vacations under $500 were in Mexico and in the Dominican Republic and range between 3 and 5 night packages. While you will most likely have to add on anywhere from $50-$250 per person in airfare surcharges depending on where you are flying from, that’s still a pretty damn good base rate. Cheap Caribbean is also offering $100 back if it rains on your vacation, which is a nice little weather insurance policy that may make your trip even cheaper if you get a few drops of rain. 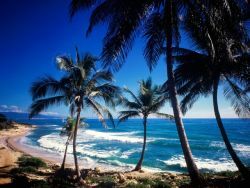 If your passport isn’t up to date or you’d simply rather stay in the states for your beach vacation this year, there are also some great deals happening right here in the good ole’ U.S of A. As reported by Hotwire’s Travel Ticker, you can now get 40% off 3.5 star resorts near the theme parks in Orlando with rooms starting at just $49/night. While it will cost you $10 more for travel after October 1, $59/night still seems like a pretty good deal. In fact, a search for hotels in the Orlando area found that similar hotels were going for almost twice as much for the same dates. If you find yourself on the opposite coast in California, the Catamaran Resort on San Diego’s Mission Bay is offering rooms up for $129 for stay now through December 31. My cousin actually got married at the Catamaran a few years ago, which means that I can testify that it’s both a beautiful property as well as $129/night being WAY less than what I paid during my recent stay. Find yourself a cheap ticket to San Diego and you’ve got the makings of a nice vacation for not a whole lot of money.